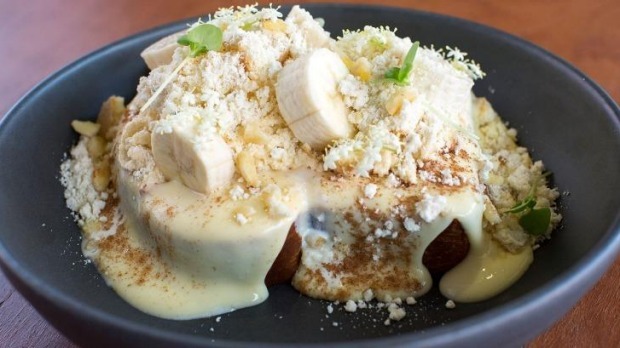 From the humble confines of what was once a nail salon, Cavalier Specialty Coffee serves some of the prettiest dishes to grace breakfast tables on Sydney's north shore. Though it has only been open since October, Cavalier's reputation has flourished. When we arrive on a Sunday morning, the narrow shop front brims with diners as a small queue for tables lingers nearby. The St Leonard's cafe is the realisation of a dream by co-owners and childhood friends chef Harry Kolotas and Anthony Lofaro, a plumber-turned-cafe-manager. Its minimalist design has American oak paneling lining the walls with exposed copper light fittings adding a touch of grunge. The understated fitout means attention is focused on the open kitchen, where Kolotas banters with customers while surveying each dish before it's whisked away. The menu adheres to the small and large plates ethos, with a handful of gourmet sandwich and salad options for those craving convention at lunchtime. But to seek out convention at Cavalier is to miss the point. The menu may be modest in size, but the dishes are artistic achievements where delicate flavours are melded with fine-dining trimmings and served without the wallet impact. The menu changes every five weeks, a reflection of the cafe's fresh, local and organic mantra. "We really think very hard before anything reaches the customer," Kolotas says. "The only way anything gets on the menu is through a trial process." But one dish – Oldskool Newskool Salmon – has proved so popular Kolotas jokes he'd face a riot if he tried to remove it. 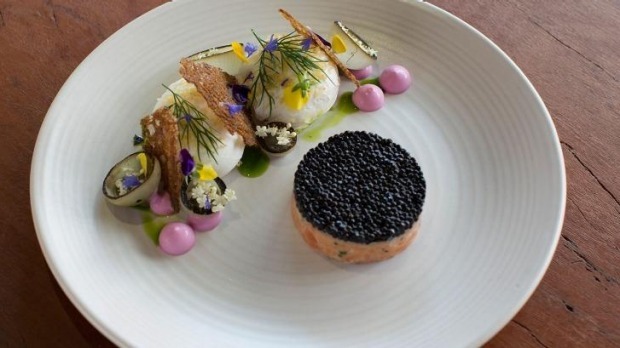 It's salmon done three ways – cured, poached and smoked – and arrives as a thick pink disc topped with splayed cucumber slices and a generous mound of caviar. The melded salmons create a curious texture. Generous flakes are bound with a light salmony pate while pops of salt from the cured salmon add an element of surprise. The fishy extravaganza takes 30 hours to prepare, but is almost overshadowed by its supporting cast. Two poached eggs are flanked by just-charred onion shells, upturned and filled with a vibrant beetroot yoghurt and black garlic mayonnaise. A garnish of bright edible microflowers and salty rye crispbreads finishes off the spectacle. For those who like breakfast best when its lines are blurred with dessert, the English trifle French toast is a must. It's impossibly generous for a small plate, arriving as a slab of spongy brioche buried beneath a cascade of custard and fresh banana chunks. The airy brioches offsets the richness of the custard and is perfect for mopping up the accompanying whipped cream. A smattering of green microherbs add bright notes, and a dusting of vanilla biscuit crumbs gives it a lovely crunch. We finish with the O.G. Chia, a kaffir lime leaf-infused chia seed pudding surrounded by a moat of toasted honey. It arrives adorned with a heavenly coconut cloud – think a cross between a mousse and a foam – and a spoonful of homemade fig and maple jam. And the "fresh fruit" promised on the menu turns out to be fresh raspberries, lychees and passionfruit. It's summer in a bowl and perfectly encapsulates Cavalier's exaltation of fresh and local ingredients. Naturally, given the namesake, we've washed it all down with some very fine coffee. Before opening Cavalier, Kolotas spent three years working in Sydney's specialty coffee scene and knows a thing or two about a good brew. He has chosen beans from his favourite Australian suppliers, with three different types on offer depending on how you like your poison – espresso, batch or filter. Byron Bay roaster Marvell St Coffee supplies the house roast, while a different guest bean is showcased each week for the black coffee aficionados. Our flat whites hit the spot – deliciously robust and velvety. By now, we're perfectly replete but without the lingering regret of a greasy morning-after breakfast. 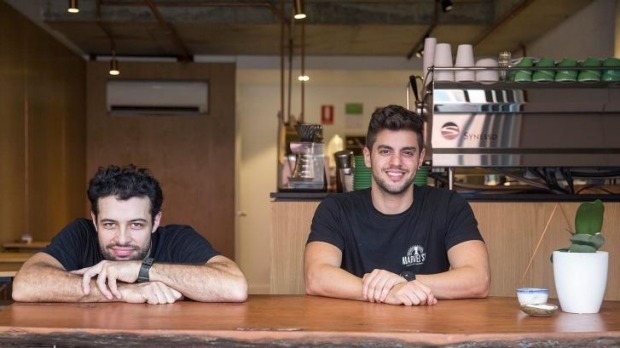 "We just wanted people to come in and have a really nice coffee and food that would leave them really satisfied over really full," Kolotas says. Oldskool Newskool Salmon; English trifle French toast; the coffee. A variety of single origins on rotation for espresso, batch or filter.